The alpine chamois arrived in New Zealand in 1907 as a gift from the Austrian Emperor, Franz Joseph.The first surviving releases were made in the Mount Cook region and these animals gradually spread over much of the South Island. The chamois is a member of the sub family caprinae, or goat antelopes. It is one of New Zealand’s most graceful game animals. The horns of the chamois found in New Zealand are as large as any found elsewhere in the world. Trophy horns start at 8 ½ inches long but can be as long as 11 inches. The chamois has keen senses especially its eyesight. It is very vocal when disturbed emitting sharp warning whistles. The winter pelts are a luxurious black colour, with white facial features. In summer they are an attractive fawn tan. Chamois can be hunted all year round, however their pelts are at their best from April to August (winter colours) and December to February (summer colours.) Their rut period is May/June. 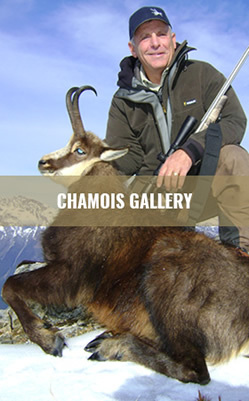 New Zealand Trophy Hunting chamois hunts are either on foot, from spike camps and huts, or by helicoptor access. Chamois inhabit the bushline and high alpine meadows of the Southern Alps and their foothills. An adult buck with his full winter coat makes an impressive full body mount.